AMD Wish List Contest - Week 3! A random drawing will take place among eligible participants. The winner will be chosen on December 11, 2015 at 3:31pm CST and announced here on the thread soon after! Congratulations to the winners of week 1 & 2! First of all congratulations to akariko and sween for your winnings. Thank you inkice!!! !I'm so excited! Whether you win or not ( or are even eligible ) I hope you all have a Merry Christmas! No way that I will be able to survive without this, so yeah, hehe. OK, this is a second try. I'm excited - it's December now! I hope you enjoy the holiday season. Here's my AMDWishListEntry for Week 3! Surprise, its the same albeit with a big announcement. nice #payingitforward are you ? Yep, im payingitforward and as i said if i win any of those 2 components, the one which i already got , will be gifted to a friends who's in need of it at www.gamingtribe.com. I fully understand you cannot simply take me at my word, for how good I have been, so I made sure I could provide evidence from a third party. I think you will now find all evidence of how good a boy I have been suitable for me to be included on the Wishlist. Now that my rig is PROPERLY in the Red Rig Showcase it's time to add this again. Those that win, I hope you take it like Erwin and pay it forward. Nothing says #PositivityThroughGaming like that. Well i have recently quit my dead end job and have decided to pursue my graphic design and custom pc case business full time. I will need a powerful GPU to use in my Flagship case and also for fast render times for my VR project. Good luck everyone and i hope you have a wonderful christmas. I made the Santa, Christmas Tree and present box a little hobby of mines but anyway Good luck everyone! amdwishlistentry Here goes, can't believe I missed the first two weeks of this. Best of luck everyone! Are we allowed to enter here and on twitter? I don't see instructions for twitter on the rules page. Would be really nice to have a working PC for longer than just a short while. It's beginning to get depressing to be honest. Not to mention how nice it would be to be able to actually play games. 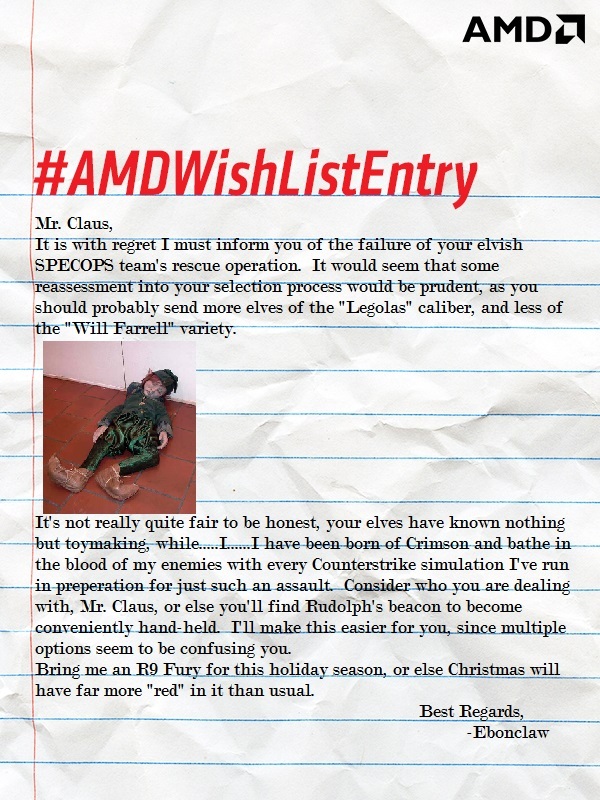 I hope Santa sees my #AMDWishListEntry. Congrats to the winners and good luck everyone. here it is week 3.....SANTA>>>>HELP!!!!!!!!!! The previous winners are very lucky, congratulations! I hope to join you in this luck very soon! Here it is my week 3 wish list! Hope everyone else is having fun and is excited about this as I am. Happy Holidays everyone!! Radeon DDR3 memory would be cool! Congratulations to ebonclaw on winning week 3 of the AMD Red Team Wish List Contest! Congrats ebonclaw on the win! Hostilities can cease & the remaining hostages either released to their families, or given to a butcher to reduce the evidence to venison sausages. Gratz ebonclaw and @BrianoStorm !!!! You're post here have been very entertaining to say the least! Thank you all so very much! I just casually checked be contest on my phone as i sat down for dinner to see who won and nearly jumped up in the middle of the restraunt! I promise to deliver a post worthy of my username later as my phone is about to die from rapidly texting my friends. I am beyond thrilled. Thank you AMD You just saved Rudolph and in turn Xmas! I like AMD,so AMD is always my first choice.Whether graphics cards,laptop,or even NAS. Now I wish I can get PS4 or AMD processors.Thanks!